In honor of Mr. Robert Nesta Marley’s 68th birthday, I thought a little numeric homage was in order. You know, for a man who rolled more numbers than the average Joe, if you catch my drift Mon. Bob Marley was the Third World’s first pop superstar. He was the man who introduced the world to the mystic power of reggae. He was a true rocker at heart, and as a songwriter, he brought the lyrical force of Bob Dylan, the personal charisma of John Lennon, and the essential vocal stylings of Smokey Robinson into one voice. 34 – 34 Ridgemount Gardens, Camdentown, London, England. Bob’s London address in 1972. ONE Drop. Song Title, Survival, 1979. And a nugget for the road (pun intended). Bob drove a BMW once he started making some money…and why? He used to tell whoever would listen that the letters stood for Bob Marley and the Wailers. He later got rid of the Beemer though, saying it caused him nothin’ but trouble. He bought a jeep. Thanks for reading. Watch the documentary, Marley, on Netflix, if you haven’t already. Heart wrenching at times. Particularly his pre-show rendition of I’m Hurting Inside, just before his final show in Pittsburgh. As of 1998, I had never been on a show like The People’s Court before, not even to a taping. Having seen the show a few times, particularly with Wapner in his post-Rain Man prime, I was familiar with the format, the set, the premise and the unmistakable music. But nothing, and I mean nothing, could prepare me for my actual taping. When we (and by “we” I mean myself and my “character witness” Craig) strode through the doors that led to the courtroom set, in boomed the familiar music (bah-dah-dah-dah)…really loud. A) I thought that music would be added in post production/editing – boy was I wrong; B) I was in the moment, game face on, ready to tear my opponent a new one…focusing on my arguments and such; C) I knew this would be on television, so I did all I could to fight back a surge of uncontrollable laughter that was quickly emerging from deep in my stomach; and D) I may have torn a muscle or two in my gut during said struggle, but the laughter was somehow suppressed…not the wry smile, however, which Easy Ed noticed and made reference to during a commercial break – He whispered, “I saw you trying not to laugh, and you should know that despite all evidence to the contrary, my courtroom is a serious place.” He then winked at me, and the rest, as they say, is history. 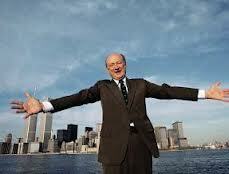 I will miss his Honorable Ed Koch and my “slam dunk” victory. 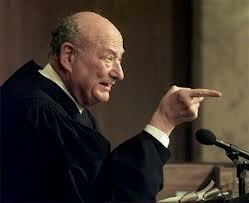 Edward Irving Koch, may you rest in peace.